Learning how to paint with watercolors is lots of fun. 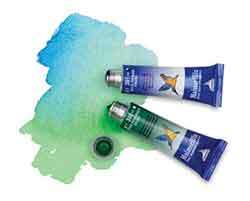 There are different ways to paint with watercolors. 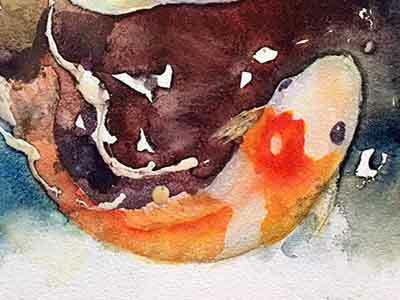 I want to share with you a watercolor technique I thoroughly enjoy - pouring watercolors. It is unpredictable and that is what makes it fun to me. 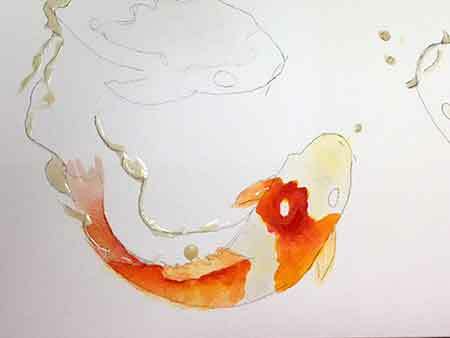 Follow me as I paint some colorful Koi and pour watercolors for the background. 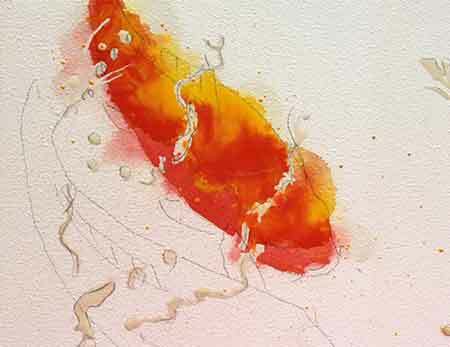 The challenge of how to paint with watercolors is controlling the water and paint. 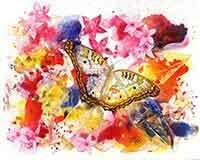 I enjoy a challenge, which is what makes painting with watercolors enjoyable to me. The painting is on a 11x14 Aquabord. 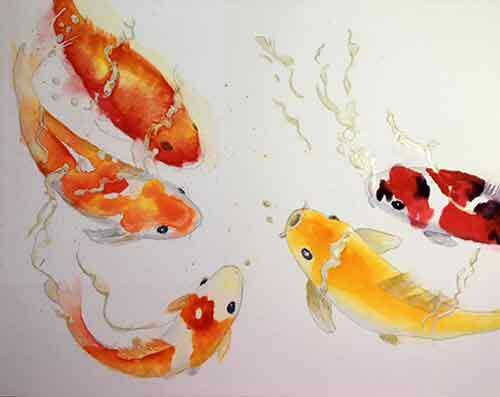 Transfer the Koi drawing to the painting surface with graphite paper. Mask the highlight areas on the water with frisket. Let the masking fluid dry completely before proceeding. 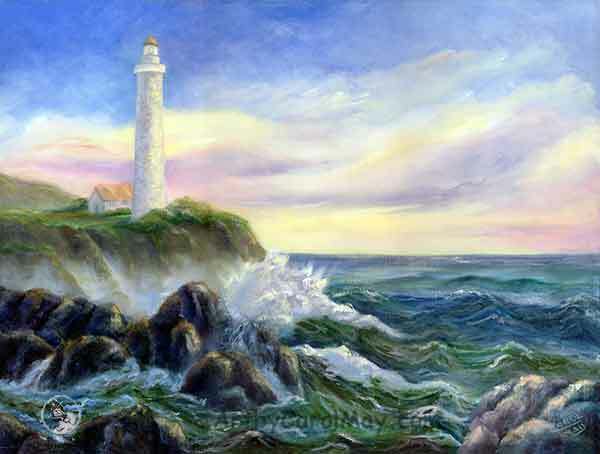 In this painting I used the rule of thirds for the composition. 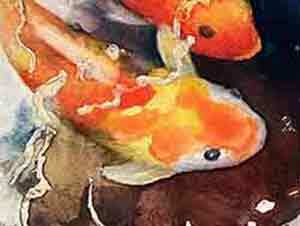 More about how to preserve the whites in watercolor paintings. 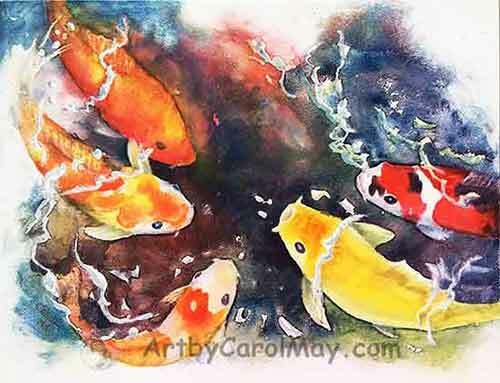 I started the painting with yellow Koi who is the focal point of the painting. We bring attention to a focal point by using warm verses cool colors. We also use contrasting values. I painted him with New Gamboge. I added a bit of blue to grey down the fins. 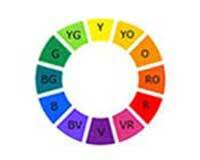 The eyes and mouth are a combination of red and blue that makes a black. 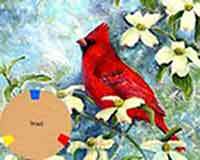 Start the painting with the focal point. 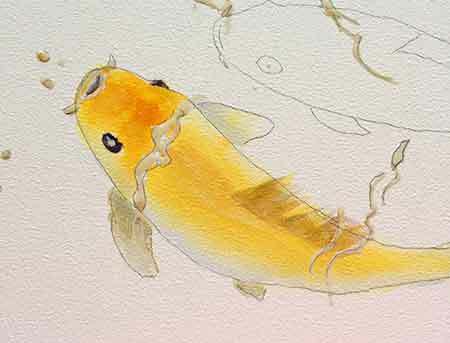 Next is the side-kick of the yellow Koi. I made it a bit smaller thinking that it would look deeper in the water. We'll see how it works when we get farther into the painting. I first painted yellow on the orange parts. While it was still wet I dropped in some Quinacridone Red. They mingled together to create orange. I lightly used some yellow to indicated warmth on the white areas of the fish. Let the colors flow to make orange. Next is the body guard for the yellow fish. He looks tough, don't you think? I wet the colored areas of the fish with clear water and left the white areas dry. I first tried the Quinacridone Red, but it was did not cover enough for me. So I used some Winsor Red to paint the red areas. While the red was still wet, I added some black spots. They softly mingle together. Oh the beauty of learning how to paint with watercolor. This fish I tried something different, I did some pouring. The thick, watery yellow went on one side. Red went on the opposite side of the fish. I wanted the two colors to mingle together. They did, but they also ran outside of the small area of the fish because I had so much water. I sopped up what I could, but I wasn't too concerned because the dark background would cover the runs. It's part of the challenge of how to paint with watercolors. I experimented with the top, left fish. The major painting is done on the Koi. I will detail them after the background is finished. When the background is done, we will be better able to see the colors and values. Then we can use them to our advantage. Mix about a quarter inch of each color into separate containers. Add about a tablespoon of water. Stir them thoroughly to dissolve all the paint. Mix the paints into cups with water. Leave the background dry. Keep the painting support level. You will be better able to control the colors and keep them out of the Koi on a level surface. I started with the blue in the upper right. Then I put some red on the left. You can see the red running into the blue. I spritzed the top edges of the blue and red to make them softly move out into the white. The pouring is finished. I let it dry overnight. 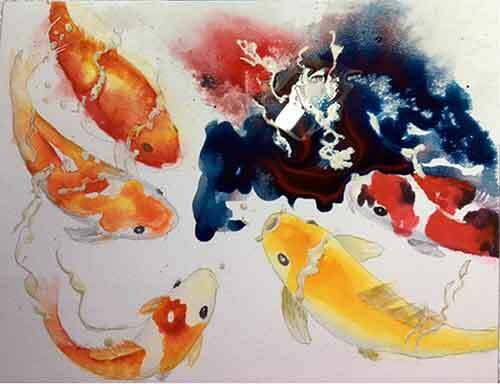 The colors between the lower left Koi look brown. Oh-oh, I realize what I did. I broke one of my own rules. I mixed Winsor Red. It is not a transparent color. 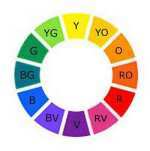 It doesn't mix well with other colors. So I got brown instead of a purple. But actually it makes a warm background for the warm fish. The background around the yellow focal fish is cool. The contrast brings attention to the focal fish. The pouring is finished. Let it dry. 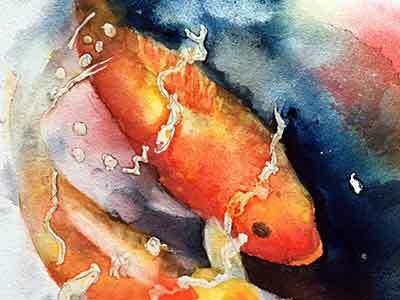 I went to each Koi and softened the edges between the fish and the water. 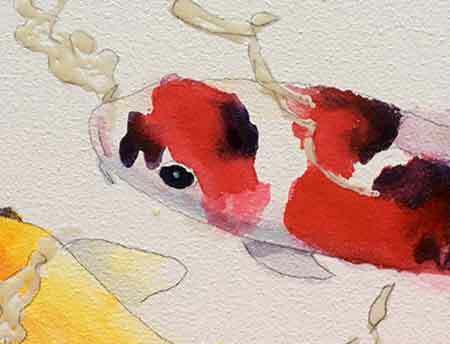 The hard edges are left on the focal Koi to make him stand out. 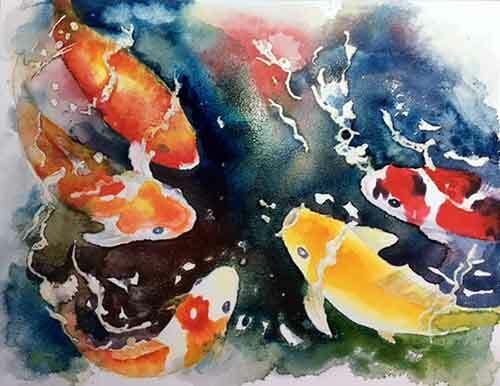 I applied a thin wash of blue around the edges of each koi to give them form and set them into the water. 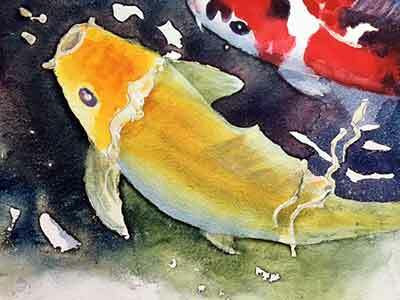 Where I accidentally poured watercolor over their fins, I pulled out the fins with a stiff damp brush. When I was first learning how to paint with watercolors, I made the mistake of removing masking from damp paint. What a mess the masking picked up paint. I got paint on my fingers and touched it into areas where it didn't belong. A lesson well learned. Let the painting dry. Then remove the masking. After the masking was removed I went through all of the water swirls with a damp brush to soften the edges. I then shadowed the water swirls to give them form. The top left fish had too much contrast and was competing with the focal fish. So I lightened his tail and darkened the background to the left of its tail. I spritzed water on its background to the right of its body and removed it. I replaced it by pouring in red. I also removed the swirl across its head. 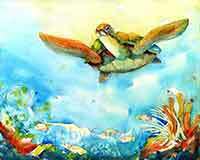 i wish you many successful paintings of your own!